There are many books available for the pet bird owner or parrot lovers in general. They range from specific species guides that can help you care for your pet, to first-person accounts of bonding with a parrot, and beautiful collections of photographs in volumes intended to grace your coffee table. 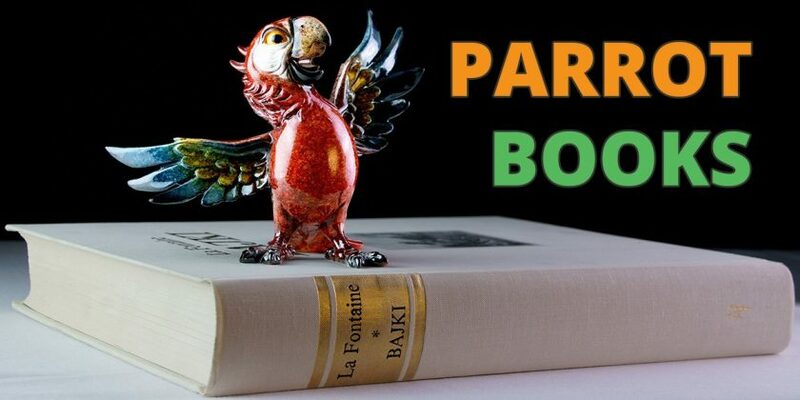 Let’s look at some books that any parrot lover would be happy to add to their collection. This large and comprehensive overview of parrots will look good in any parrot lover’s living room. It organizes the parrots of the world by geographical distribution and encompasses 356 different species. Featuring 146 stunning color plates, this book is sure to have you marveling at the beauty of parrots. Designed to primarily serve as a field identification guide for parrots, this book covers 350 species and includes 88 color illustrations. Range maps and information concerning conservation efforts on threatened or endangered species are also incorporated into this superb volume. The main goal of this book is to talk about the adoption of parrots that have had previous owners. In doing so, it also discusses the reasons that people have for giving up their parrots and gives a very good overview of what it is like to own and care for a parrot. This book is recommended reading for anyone who is considering adding a parrot to the family. Focusing on the changes that will occur over their lifetimes, this book is a guide to living a long, happy life with your parrot. It covers various aspects of parrot care that change over time such as nutrition, healthcare, and travel. The book also talks about the changes that we impose on our parrots, and how to navigate issues such as moving, marriage, and the introduction of other pets. Clicker training is a relatively new way of training animals, and this book brings this method to the world of birds. Simple guidelines help you improve your relationship with your parrot, and the training and attention will be of great benefit to your bird’s mental and emotional health. Using clicker training you can teach your bird tricks, improve its ability to socialize, and curb problem behaviors. The book claims that birds of any age can benefit from this kind of training. This comprehensive guide to raising and training your parrot covers just about every aspect of parrot ownership. Topics such as choosing the right bird for you, socializing and traveling with your pet, teaching it tricks, and keeping it healthy are all delivered with your bird’s well-being in mind. The book has plenty of pictures and illustrations and is meant to be used with any kind of parrot, from budgies to macaws. Both professional breeders and amateur bird owners will benefit from the information in this book. It covers subjects such as maintaining a bird nursery and tending chicks, as well as offering feed formulas for babies of various species. Advice is given on dealing with common problems encountered with baby birds like dehydration, discolored feathers, and infections. The audience for this book is the inexperienced bird breeder. It is written by a professional breeder and details the rewards and problems that come with breeding parrots. The author talks about who should and shouldn’t breed parrots, how to obtain quality breeding birds, maintaining flock health, and rearing chicks among many other subjects. Over 60 color photographs are included in this indispensable book for the prospective parrot breeder. Everything a new parakeet owner needs to know is in this book. A species guide is an essential addition to your avian library, and you should obtain one for your particular species of bird. The Barron’s line encompasses many breeds and all of their volumes provide the same excellent level of information for pet bird owners. Here is another species guide that focuses on the African Grey. We mention it to illustrate another great line of species guides, The Complete Pet Owner’s Manuals. You are sure to be able to find a species guide to assist you in caring for your bird, no matter what kind of parrot you own. This is the incredible story of a young man searching for direction in San Francisco, California. Moving there with the intent of pursuing a musical career, he instead becomes enthralled by the flock of wild parrots that live on Telegraph Hill. He gains the trust of the flock and becomes the local parrot expert and a tourist attraction. Eventually, his life takes a major turn when his passion is caught on a documentary film. It is a great example of how humans and wildlife can bond with benefits to both parties. Here is a book that documents human interaction with parrots since the age of Alexander the Great. Subjects covered in this book include the impact of parrots on the Western world and their meaning in art, literature, and history. The irony of humanity’s negative impact on the wild populations of these treasured birds is also discussed by the author. An excellent choice for those interested in parrots or history. We hope this list of parrot books will guide you as you research the world of parrots. They can help you enjoy your pet bird, or just inform you of the beauty that exists in the parrot world. If you found this interesting then you should check out our guide to the world’s best bird and parrot trainers available here.